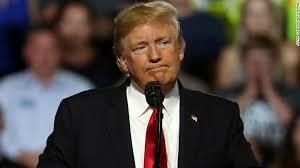 CNN) On Thursday night, President Donald Trump flew to Montana to headline a rally for Matt Rosendale, the Republican nominee against Sen. Jon Tester (D) this November. Trump's speech was, like most of his addresses, a remarkable mix of stream-of-consciousness thinking, fact-challenged claims and demagoguery. I go through the transcript of Trump's speeches to pick out 30 or 40 (or 50) of the most eye-popping lines, the sentences that stood out most to me for whatever reason. I tend to take a light-hearted approach to this exercise because Trump's word-salad tendencies when speaking extemporaneously are exacerbated when reading a transcript of his speeches. Trump's speech on Thursday night contained a number of genuinely dangerous lines, lines no president before Trump would even considering uttering among a small group of friends -- much less in front of thousands of people. Below, then, are the 11 most dangerous lines Trump said last night -- and why each one poses a real risk to the body populace. "She gets special treatment under the Justice Department. ... Sorry. Sorry. Sorry. Sorry. She gets special treatment under the Justice Department." Trump is talking here, of course, about Hillary Clinton. He's interrupted in his attack by chants of "lock her up" from the crowd. Trump's undermining of the Justice Department -- which he has done on an almost-daily basis since winning the White House -- is deeply dangerous to how people perceive those who are tasked with enforcing our laws. When the President of the United States insists the Justice Department is biased and can't be trusted, it erodes one of the long-standing pillars of civil society. 2. "It's a rigged deal, folks. It's a rigged deal. I used to say it. It's a rigged deal. It's a disgrace." It's not entirely clear to me what Trump is referring to here -- whether he's reiterating that the FBI is biased or, more likely, casting aspersions on the whole system of government. Either way, he's fomenting (for political gain) the resentment that lots of people feel toward their government and toward societal establishment more generally. Trump is provoking people to believe that there is some "they" out there working to keep you down. And enjoying doing it. 3. "But we signed a wonderful paper saying they're going to denuclearize their whole thing. It's going to all happen." assertion that North Korea has agreed to denuclearize and that "it's going to all happen" is a massive overstatement of the facts. What Trump and North Korean leader Kim Jong Un signed in Singapore last month was a sort of outline of an agreement. There was nothing binding in it. And this week we got word that satellites have picked up what looks to be more construction at a ballistic missile site in North Korea. So yeah, this version of the North Korea story via Trump misses some major points. 4. "They are so dishonest. Fake news. They're fake news media." Eight days ago, a man walked into the Capital Gazette newsroom in Maryland and murdered five staffers. His motives were his own -- he held a grudge against the paper for its coverage of a criminal harassment claim against him -- and had nothing to do with Trump's repeated rhetorical attack on the media as "fake." Full stop. That said, one might think that in the wake of such violence committed against reporters, the President of the United States might be more mindful of savaging the media to a crowd of his supporters. That would be the responsible thing to do. That isn't what Trump did. 5. "You know what? Putin's fine. He's fine. We're all fine. We're people." This is a dangerously naive view of the Russian president. First of all, the US intelligence community has unanimously said that Russia actively meddled in the 2016 election. Under Putin, Russia invaded the Ukraine and annexed the Crimean peninsula. Then there's the fact that people critical of Putin -- including journalists -- keep winding up murdered under very suspicious circumstances. These are not the actions of a "fine" person. 6. "They're fake. They're fake. They quote sources -- 'A source within the Trump organization said' -- a source. They don't have a source." Trump's impugning of the media's use of unnamed sources is part of a broader attempt on his part to undermine a free and independent media. For those who cheer that effort -- and insist the media deserves what they get -- I would ask you a simple question: Have you ever seen what life is like for the citizenry in a country in which the media is state-run? 7. "A vote for the Democrats in November is a vote to let MS-13 run wild in our communities." rhetoric can be a bit over the top. But this feels beyond the pale to me. Trump is purposely weaponizing fear here. Democrats do not, in fact, want to let the violent MS-13 gang "run wild in our communities." But Trump knows that the image of tattooed thugs marauding your neighborhood strikes terror in the hearts of many people. And that terror is useful to him in a political context. 8. "Democrats want anarchy, they really do, and they don't know who they're playing with, folks." Two things here. First, Trump is saying Democrats want "anarchy" -- total chaos to be loosed on the United States. Again, weaponizing fear. Second, the threat inherent in "they don't know who they're playing with" is purposeful and dangerous. If the 2018 or 2020 election is regarded by people as a war between the rule of law and anarchy or between war and peace, then there will be people out there who feel as though using any means necessary to win is totally justified. And that is a scary proposition. 9. "I said it the other day, yes, she is a low-IQ individual, Maxine Waters. I said it the other day. High -- I mean, honestly, she's somewhere in the mid-60s, I believe that." 10. "Winning the Electoral College is very tough for a Republican, much tougher than the so-called 'popular vote,' where people vote four times, you know. Much tougher. Much, much tougher." Study after study has shown that claims of widespread voter fraud and abuse are simply not borne out by the facts. Which doesn't stop Trump from pushing the idea to his base by insisting that people "vote four times" in the popular vote. And if you don't think trying to disqualify the results of an election without evidence is dangerous, then you aren't thinking straight -- or at all. 11. "We will take that little kit and say, but we have to do it gently. Because we're in the '#MeToo' generation so I have to be very gentle. And we will very gently take that kit and we will slowly toss it, hoping it doesn't hit her and injure her arm even though it only weighs probably two ounces. And we will say, I will give you a million dollars to your favorite charity, paid for by Trump, if you take the test so that it shows you're an Indian." remarkable. In his usual riff about the questions surrounding Massachusetts Sen. Elizabeth Warren's claims of Native-American heritage, Trump shows his true colors on the #MeToo movement. He seems to suggest that the movement, which grew out of a series of news stories of powerful men sexually harassing women, is about political correctness run rampant. Trump seems to think -- or at least say -- that he has to be careful not to offend the #MeToo movement by throwing a DNA heritage kit at Warren. Which both deeply misunderstands what the #MeToo movement is about and denigrates the entire idea of women feeling safe to come forward with allegations of sexual misconduct.